Swine flu may be inspiring fear worldwide, but for Stephan Zielinski of San Francisco, California, it inspired a song. The genes underlying swine flu inspired one amateur musician to compose music based on it. 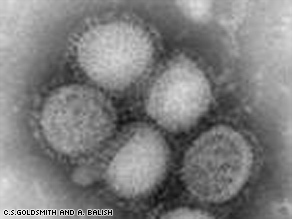 The virus has the classification H1N1 because it includes two key viral proteins, hemagglutinin (H) and neuraminidase (N). Zielinski took the genetic sequence of a variant of hemagglutinin and created a computer algorithm to turn it into music. "Although the map is there and you can even make a song out of it, we can't explain it to these itty bitty little cells in body," he said. Using computer programs he created himself, as well as a commercial product, Zielinski composed his song by assigning instruments and musical notes to various properties of the protein. Zielinski took the various categories of amino acids, the building blocks of the protein, and assigned each a different instrument -- piano, organ, low synthesizer, percussion. The melody was created by assigning notes to specific amino acids. Each beat of the song also corresponds to one of numerous amino acids. He first learned of the sequence through an immunologist friend at the Mayo Clinic, he said. Zielinski saw it as a form of highly organized information that a human did not design. "The only way I could look at that and make sense of it, since I'm not a biochemist, was, well, I could try translating it into another very organized form of information that people do, and then see if I could hear anything. And the answer, of course, turned out to be no." But even if the mystery of the virus did not reveal itself in musical form, the result is a curiously melodic, innovative, somewhat soothing work. Dr. Jay Steinberg, infectious disease specialist at Emory University Hospital Midtown in Atlanta, Georgia, called it "nice ambient music" that's reminiscent of Brian Eno. Less methodical swine flu songs are also emerging on YouTube. User "CelicaAaron" parodies the Jonas Brothers' song "Lovebug," crooning, "I can't get your snout out of my mouth / I'm sick to my stomach all the time." A short spoken-word effort by user "Micfri" warns, "You know who has swine flu? Pigs!"